"These vegetarian balls can be served as a main dish or appetizer. As a main dish, serve with white or brown rice. As an appetizer, they are delicious dipped in tomato-ey sauce of any kind (ketchup, barbeque, salsa). In the rare event that there are leftovers, the balls take on a great texture when reheated in marinara sauce and are good served with pasta." Pick through the split peas removing rocks, then rinse. Soak, covered by 2-inches of water until soft enough to be broken with your fingernail, 3 hours to overnight. When soft, drain peas, then puree in 1 cup batches in a food processor or blender until smooth along with the garlic, curry powder, salt, and serrano pepper. Add water as needed to make a thick paste. Sift baking powder and 1/2 cup of flour into a large bowl then stir in the pea puree , adding additional flour to make a stiff batter. Heat 2 inches of oil in a deep-fryer or deep, heavy skillet over medium-high heat to 375 degrees F (190 degrees C). Drop batter by the teaspoonful into the hot oil in batches of about 10. Turn balls when they float and their bottoms turn brown, and continue cooking to brown the other side, about 2 minutes. Drain on paper towels, and sprinkle with additional salt if desired. See how to make a simple, spicy Indian side dish. Poulourie can be baked instead of fried. Add 2 tablespoons of vegetable oil to the batter, then drop by spoonfuls onto a baking sheet sprayed with nonstick cooking spray. Bake in a preheated 375 degree F (190 degree C) oven until browned, about 15 minutes. 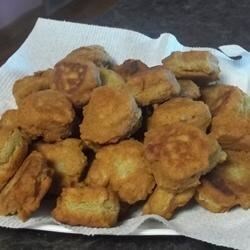 I can't deep fry, so I shaped these into patties and fried them on the frying pan. I omitted the salt. The pepper and curry add a great flavor! Thanks for this delightful recipe! My husband and I loved it, but the kids did not. It was pretty oily, so it will be just a special treat. Very interesting. Best as a side dish--not as a snack like I fixed them. Not sure what I would fix them with--but worth a second try.